When chalk labels and chalk markers first came out I didn't rush out to buy them because I wanted to see them in use by others before I put out money buying any. Well now that I have seen and I have used them on many surfaces I am in love with them. 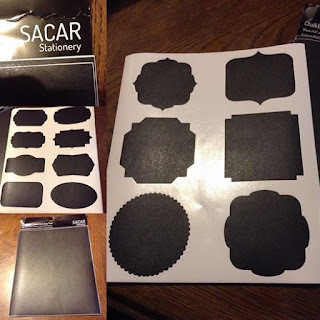 I really love this set from Sacar Stationary because it has so many labels including large sheets that can be used as is or cut into any shape you wish. Great for organizing, decorating, crafting, or gift giving. Easy to stick. Can be used with chalk or chalk markers. With 14 different designs and 120 stickers you will be set for awhile. 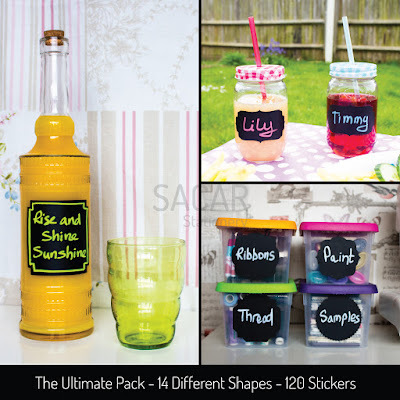 The Sacar Stationary can be found on Amazon. What Sacar Stationary has to say about their product. Disclosure: MarksvilleandMe received one or more of the products mentioned above as part of a promotion with Tomoson and Sacar Stationary. Regardless, MarksvilleandMe only recommends products or services we use personally and believe will be good for our readers. Some of the links in the article may be “affiliate links.” This means if you click on the link and purchase the item, I will receive compensation. If you would like MarksvilleandMe to review a product or service please contact us at marksvilleandme@gmail.com.